Last evening, Keith Law tweeted a rumor that launched a thousand fat jokes. Jesus Montero, one time can’t miss prospect and current whipping boy had apparently tried to enter the stands during some sort of vague altercation. Soon after, conflicting information started filtering in – no one had been ejected. Montero wasn’t in the line-up. A few hours later, we learned what had apparently happened was that Montero had some sort of verbal altercation with a scout in attendance, and had to be restrained by the team pitching coach from going after the guy. The twist in all of this was that the scout’s employer was the Seattle Mariners. That version of events is reflected in MiLB’s story about the incident, which you can read here – seriously, go read it. At the time, this seemed to be the last act in the tragic drama of Montero’s Mariner tenure: from starting catcher and future All-Star to minor-league DH to a casualty of anger management issues in a short-season Northwest League park. Today, as we learn still more about the incident, it’s no longer clear that all of the blame lies with Montero, and what seemed like a colossal mistake by the young 1B/DH (he’s still only 24) begins to look more like the sad end of a seriously dysfunctional relationship. This is the baseball version of Rashomon; we have visions of an incident from a few vantage points, but I’m not sure we can see – or understand – the full picture. What we think we know is that Montero was acting as the 1st base coach (this is really common in the minors; a player on his off-day generally acts as the 1B coach), and at the end of the Aqua Sox half-inning, a Mariner cross-checker (senior scout), Butch Baccala, yelled at Montero to hustle off the field. I have no idea if Montero yelled something back at that point, and a part of me hopes he did, so I can better understand/begin to rationalize the cross-checker’s escalation of the sitaution. The cross-checker then bought an ice-cream sandwich and had it delivered to Montero in the Aqua Sox dugout, at which point Montero came out of the dugout, threw the ice cream sandwich back at the cross-checker and had to be restrained from heading up to, uh, discuss the situation in more detail. Everything here depends a bit on your prior assumptions about Montero. Given everything we heard this spring, and given the way the story trickled out of Boise last night, it was easy to jump all over him. After a suspension for PEDs, Montero ate his way out of playing shape – by his own admission, not by reading between the numbers of various weigh-ins or whatever. His hustle was constantly challenged, and when you put that together with his off-season of indulgence, you understand why the M’s might want to reinforce the message that he needs to demonstrate some effort on and off the field. His lack of effort imperiled (at best) his chances of a productive career, and you sympathize with the M’s a bit: as frustrated as fans are about The Trade and what’s happened since, think about how the front office must feel. Some of the frustration and incredulity about Montero’s fall from grace, though, has been directed at the M’s player development group, too. Montero is responsible for his choices, and he’s responsible for showing up to camp overweight, but the organization needs to ensure that their employees are doing what they’re supposed to. How does Montero just show up to camp overweight and surprise everyone? Wasn’t he playing 1B in the Venezuelan Winter League? Maybe they’d tried the nice-guy approach and saw that it wasn’t working, so they changed tack and criticized his weight in February/March. Maybe that didn’t work either. Maybe they were working with him behind the scenes, and a scout who hadn’t been home in weeks just snapped. I just can’t imagine that this is going to have a good outcome on Montero’s effort or the perception of the M’s organization. If you’re the type who was upset about Zduriencik’s latest extension, this is just more grist for the mill, and you can see this as evidence that the M’s mismanaged Montero from January of 2012 through today. Now, we’ve learned a lot more about the incident since Keith Law’s first tweet. We know the two people involved, but we still can’t piece it all together. As Geoff Baker’s story today makes clear, Butch Baccala disputes the standard version of events, but he’s not able to talk about while the M’s pursue an investigation. We still don’t know what really happened, but it seems harder and harder to imagine Montero in an M’s uniform again. Who’s fault that is depends a lot on what you thought about Montero and the M’s before last night. GM Jack Zduriencik released a statement about the incident which notes that Montero’s rehab assignment is over and that he’s being called in to talk to Jack directly. Butch Baccala’s been pulled off cross-checking duty and is heading home to California indefinitely. The M’s will also be working with Montero on his “personal issues” throughout the off-season. Hat tip to Ryan Divish, who’s been all over this on Twitter. Good on both Divish and Geoff Baker, whose coverage of this strange story has been exemplary. I would think the scout would be more likely to no longer be working with the Mariners. His lack of respect for the REST OF THE EVERETT TEAM and the seriousness of the work they’re trying to accomplish would be a problem in my eyes if I was in charge. His choice to escalate the situation by sending an ice cream sandwich to the dugout would be unacceptable too. He purposely and willfully decided to be a distraction to a group of young men being paid to perform a job that many people take very seriously. If it had been anyone ELSE besides Montero, it would clearly be unacceptable behavior. The fact that it WAS Montero shouldn’t change that. And I’m absolutely NOT defending anything about Jesus Montero. I just find it suspicious that Baccala disputes the story so far, since I can’t imagine ANYONE painting the story in a way that would fudge towards putting Montero in a more positive light. Says a lot, in itself. 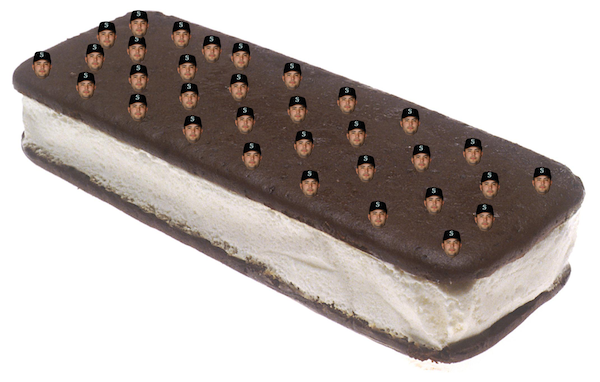 Keith Law has just said that it was an ice cream helmet and not an ice cream sandwich. I’m not sure how you could mistake throwing an ice cream sandwich with a helmet. How and why Butch Baccala got someone to deliver an ice cream helmet to a player/coach in the dugout during a game is beyond me. The scout’s job is to assess players, not to attempt to deal with performance or attitude problems. If even a fraction of the behavior attributed to the scout turns out to be true, then his employment needs to be re-evaluated. If Baccala had seen anything about Montero’s behavior or performance that was noteworthy, he should have written it up in his report and kept it confidential rather than creating an incident. Just like a reporter is there to report the news not to create it, a scout should avoid affecting a player’s performance or attitude. That’s not to defend Montero, of course. A important step toward becoming a professional in any occupation is learning to control emotions. In a 162 game season there are a *lot* of ups and downs and even the greatest players have bad days. If Montero is ever going to achieve a fraction of the promise that he once held, he is going to need to mature quickly. Time is running out. Montero is apparently a jerk – but given what outside first-hand reports currently say, it seems obvious the scout needs to be fired immediately. And given the reports from the official scorekeeper state the scout shouted “apurate! apurate!” (Or was it “andele andele”?) at Montero but don’t mention a Montero response at that point in time, it seems unlikely there was one. Just another dysfunctional day in the Mariners organization. Should the facts of the case turn out to be what originally reports, sources indicate Baccala would be in trouble. And, courtesy of Dayn Perry @ NotGraphs: the fabled Ice Cream Sandwich of Jesus. Just another feather in Uncle Fester’s hat. No wonder he was in such a hurry to get an extension. People had almost forgotten about the Montero train wreck. Jesús Montero is a WMD, a Weapon of Mass Digestion. Too bad. Given time and hard work he could be the rightie DH the Mariners are looking for. The one they have, curiously, is also overweight, an inferior athlete who can´t run, throw or field, but he can hit, or at least he could. He also costs a fortune, which the WMD does not, but at this point the WMD may not be a salvageable item. To me it seems like the scout is piling on Montero. I know he’s still a player but he was filling a coaching role at the time–and in a Class-A Short Season game no less. He sure as heck needs to run out a groundball, but I could honestly care less if he runs off the field after coaching 1st base. Montero has earned a lot of the ill-will he has received–and if he took a bat towards the stands, that was idiotic–but this situation is all about the scout. I was at the game last night and while I didn’t notice the events leading up to the incident I did notice once the altercation started. I can shed more light on this portion though. Weren’t we supposed to be celebrating Happy Felix day vs Zimmerman and the Nats? I am heading to the game, and will take in Strasberg too. Dysfunction is not new to this organization. Pineda is pitching healthy and I am hoping his man child problems are behind him-though sorry it’s for the Yanks. Where was Montero’s coach during this? Why did he allow Montero to get heckled by one of their own scouts if that is what happened? Why did he allow Montero to get a bat and the ice cream and leave the dugout? Inquiring minds want to know.